Thanks for the opinions and advice everyone I think next time I will be like Steve and Dan and remove the old wheel weights myself. I sent an email to Tempe Tyres last night. If I get no response by Thursday I will see if I fare any better with a direct phone call. So I got a flat drivers rear tyre on Saturday whilst 120km south of Sydney (I was heading back to Sydney after enjoying some Macquarie Pass driving ). I ran over a big bolt lying on the road, there was a massive rapid pressure drop detected by the TPMS, so I pulled over quickly in a safe location. I saw the tyre was deflating very quickly from a 1cm diameter bolt rammed into it, and I had to get a flat bed tow truck to Sydney. I rung Tempe Tyres on the way, and arranged 4 new Michelin PS4S (N0) tyres. I had done 22,500km in 11 months of ownership, and had been planning to change the Goodyear F1's into Michelin PS4S in the near future anyway. So this was as good an excuse as any to make the change. Tempe Tyres is a very busy place. Maybe that is a good thing... because therefore they should know what they are doing. But maybe it could also be bad... because they could be too busy to take care with your car. Anyway my question is this: What would you consider an acceptable level of scratching to the wheel when the shop removes the old wheel weights +/- the black adhesive tape when they are balancing the wheel after the new tyres are fitted? Attached are the pictures of my wheels when I cleaned them today. The pictures are in this order: Passenger Front, Passenger Rear, Driver Rear, Driver Front (before), Driver Front (after). The passenger rear wheel and driver front wheel scratches really hurt me to look at. The driver front wheel has 2 pictures. The 'before' picture is before a lot of elbow grease in removing the remaining black tape adhesive and glue residue (although after my basic wheel cleaning routine). It is meant to show that the shop tried reasonably hard to remove the black adhesive tape, and in doing so scratched the hell out of the wheel. I would have much preferred if they left the adhesive tape still mostly attached - like in the driver rear wheel picture (which is also a before picture). They caused much less scratching, and I could carefully remove the adhesive myself, taking as much time as I wanted. Am I expecting too much from a tyre shop? Does anyone have any advice how to avoid this in the future? Different Sydney tyre shop recommendations? Should I have told them explicitly beforehand to just leave the black adhesive tape intact after removing the metal weights? Porsche Dealer left off one of my options! 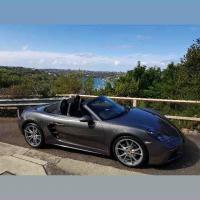 Ian718 replied to Caver's topic in Not Porsche - Everything Else. I was thinking along those lines, and then adding I'm a Porsche owning wanker = it's my fault x 10. Thanks for the insider cop knowledge Niko Much appreciated After she left and I was talking to everyone else while waiting for my wife, I begun to think along similar lines to what you said above. She was dropping her mother off at the hospital. She probably is under some stress with her mother's health. So maybe I should just give her a break. Even though it doesn't excuse her behaviour, it could partially explain it. --- Thanks for the thoughts/comments everyone. Who would have thought venting on a public forum would be such effective catharsis! So today I had to pick up my wife from the hospital where she works. I was waiting for her outside the entrance, sitting in my Boxster parked in a line of cars. A middle aged lady who is dropping her mother off at the hospital pulls up beside me and bangs her drivers side door against my passenger side while getting out in a hurry. She see me, but as she is helping her elderly mother out of the car, I don't bother her while she is assisting her. However after helping her mother she hurriedly gets back in to drive off. I now have to make a snap decision about whether or not to take her license plate details down. I see that there is at least one bit of visible damage, so decide to take a photo of her rear license plate. At this point she opens her door and becomes verbally aggressive. "How dare you take a picture of my car?" "It serves you right for parking in a (completely legal) place where you can get hit by a car door" "Maybe you should think twice before parking there again (never mind the entire line of cars who are correctly parked in a similar position" I'm half attempting to reason with her, and half attempting to block her door from hitting my car again as she swings it open again to get out. She then decides to get physically aggressive, and tries to repeatedly shove me. Keep in mind, she is about foot shorter than me and 15 years older at a guess. So the shoving is somewhat comical and definitely ineffectual. The shoving and yelling is enough to attract the attention of the hospital employee who stands at the front entrance. He is telling her to calm down and to at least pull her car over to an empty space in front of me to stop blocking the entire flow of traffic through the hospital entrance. But nope, she is busy blocking traffic and taking photos of me and my car, like I have somehow terribly wronged her. By this time I have had a bit more time to inspect the car. Her door has luckily only hit the plastic side air intake, and I have already managed to buff most of it out. I'm sure I can get it looking perfect at home. Even though the lady is acting like a complete loonie, I'm quite happy to let everything go. Anyway one last serve at me before she drives off. The people outside the hospital and the driver behind are sympathetic to my situation, and give a couple of kind words. I'm mostly just happy that the door has hit the plastic rather than the paintwork. *sigh* Crazy crazy lady. Did you put down a deposit today? If so, please share the build! Thanks for the recommendation edgy! LSR were really prompt and professional with getting everything organised. Lots of phone calls and an email keeping me up to date as well. Exclusive Body Werks was the other well recommended Porsche approved repairer option... but LSR is 10 minutes from my house. So that along with your recommendation made a big difference! Fark.... The new boxster just got T boned by a BMW into my passenger side just in front of the rear wheel. Which is now pointing 15 degrees the wrong way. Currently waiting for a tow truck... 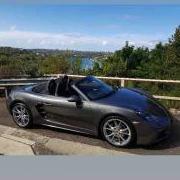 So... who are the good Porsche repairers in Sydney? Someone is sleeping in the dog house tonight! Ian718 replied to edgy's topic in Not Porsche - Everything Else.